Golf grips are often the most overlooked piece of equipment in a golfer’s bag. 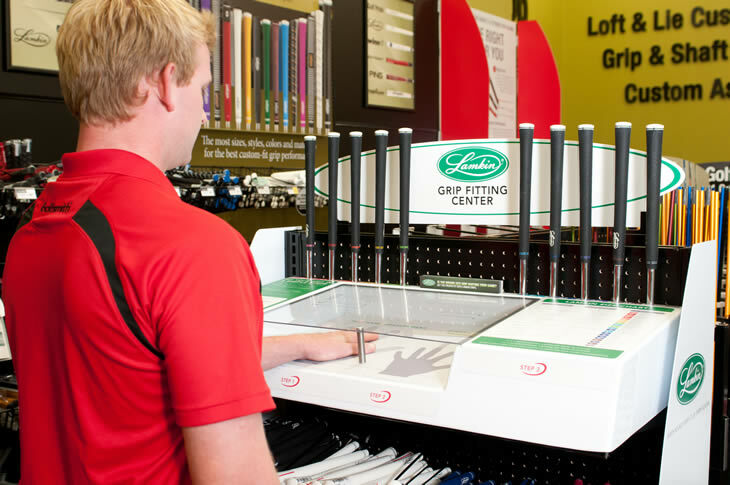 Players will research and change their ball, their driver, their putter, their shoes but rarely think about their grips. The grip is the only part of a golf club you actually touch during a swing, so it can be very important to find the right grip for you and ensure your grips are clean and fit for play. The following information will help you understand the various aspects of a golf grip and guide you in what you should consider when buying a grip. The majority of golf grips are rubber. As a material, rubber is easy to shape, easy to produce and offers a firm, yet adhesive feel. Other materials you may find in the market include silicon, elastomer and plastic. Corded grips are grips that contain a cord material in the composition of the grip. The addition of this material helps to provide more traction in your hands in the rain as well as hotter, sweatier weather. The drawback of corded grips is that some players find them to be abrasive or more uncomfortable than uncorded grips. Wrap grips hark back to the original style of leather grips that used strips of leather wrapped around the shaft. Now they use modern material to create a soft surface texture that provides a tacky touch. As metal wood technology advanced and companies began making drivers and fairway woods lighter and lighter, it was natural for the grips on these clubs to be made light also. For that reason, certain grips used on metal woods may be lighter than grips used on irons. Putter grips vary from grips for irons and woods and a couple of different ways. Firstly they don’t typically require the same level of traction or texture as players neither grip nor swing as hard with the putter as they do with a normal golf swing. Secondly, putter grips are the only grips that are permitted by the rules to include a flat edge. Typically this is added to the front of the grip to help guide you on exactly where your thumbs should be on your grip. Different sizes are also offered to improve your ability on the greens. A thicker grip helps take your hands and wrists out of the stroke, which is what most golfers seek to do to improve their putting. The drawback of a thicker grip is that you won’t get the feel of a thinner grip and if you are feel putter, or have a stroke that involves a lot of wrist action, then you will be more suited to a thin grip. When choosing a grip it is important to understand the benefits and differences between a firm and soft grip. Tour players will tend to use firmer grips as they offer better torsion control and suit their higher swing speeds. Firm grips will tend to promote or encourage players to grip the club with a lighter grip pressure. Older players and beginners may prefer softer grips that make it easier, and more comfortable, to grip them without the swing speed needed for require enhanced torsion control. All grips for woods and irons will either be round or ribbed. A round grip is symmetrical in design, whilst a ribbed grip features a small ridge that runs the length of the grip. It is used as a guide or reminder to players or where their hands and fingers should be on the grip. When companies began offering adjustability in woods, the grips on those clubs needed to be changed. If the grip had a ridge, logo, or design only in one direction, if the clubhead was altered, thus altering the shaft alignment, the grip would no longer be properly aligned. Thus, grip manufacturers began using round, logo-less grips that could be used on adjustable drivers, fairway woods and hybrids. Just like you should wear a pair of shoes that feet your feet, you should use a grip that fits your hand. Studies suggest that up to 75% of players are using the wrong size of grip. Conventional wisdom suggests that a proper size grip allows the fingers in a golfers top hand to barely touch the palm. Some players like to use a larger grip, that limits wrist movement, to limit a draw or hook and vice versa some players try to limit a slice with a slightly thinner grip. As for grip sizes, whilst they can vary with manufacturer, they tend to fall into one of the following 5 sizes. Standard = 0.580 to 0.600 inches in diameter. Junior = Various sizes, smaller and shorter than standard. Undersize =1/64 inch smaller than standard. Midsize = 1/16 inch larger than standard. Oversize/Jumbo = 1/8 inch larger than standard. To make minor adjustments in the size of a grip, some players may choose to add various layers of tape between the shaft and grip. One wrap of tape will typically add 1/64 of an inch in diameter to the grip, 3 wraps adds 1/32 and 6 wraps equals 1/16. Adding layers of tape is a practice used mainly by Tour players. Some players like to have a different level of thickness under each hand and may add more layers to either the top or bottom portion of the grip. Bubba Watson has used up to 10 layers of tape on his grips in the past! A common question we get is “how long does a grip last?” The truth is that the answer depends on the type of player you are. The life of grip is can depend on how hard you grip the club, how often you practice or play, how many practice swings you take and how your maintain your grips. Most golf grip manufacturers suggest grips should be changed every 40 rounds, or once a year. It is important to maintain and check your grips regularly. Often you will be able to feel when your grips are in need of replacement, but some tell-tale signs can include smooth or hard areas on the grip, cracks in the material, shiny spots, or wear around the areas your fingers typically sit. If you notice any of these signs, you should consider getting your clubs regripped. You can prolong the life of your grips with regular cleaning. Most grips can be cleaned with a mild dishwashing detergent. For rubber grips (including cord) use a soft abrasive pad or brush. For non-buffed grips a washcloth should be used instead of an abrasive pad or brush. In either case, after scrubbing, the grip should be thoroughly rinsed in warm water to remove all remaining soap residue. The grip then may be air or towel dried. Rubber is also susceptible to heat so where possible, it is advised you do not leave your clubs or in overly dry or hot surroundings. Most golf shops or pro shops should be able to install and change grips. Changing one club can take just a few minutes, but if you are getting a whole set it is best to expect a least a day or two. Front ridge gets your palms neutral to hole more putts. Jordan now has SuperStroke grips throughout the bag. Tour inspired grip in choice of Contour & Straight. SuperStroke's smallest grip gets adjustable weight capability. Adjustable counter-balanced weight in grip sets up perfectly. Innovative sliding counterweighting allows precision for all strokes. Plus Series lets you easily switch a 50g weight in and out. MCC Plus4 grip is thicker under lower hand to reduce tension. Spike maker moves into grip technology for clubs and putters.